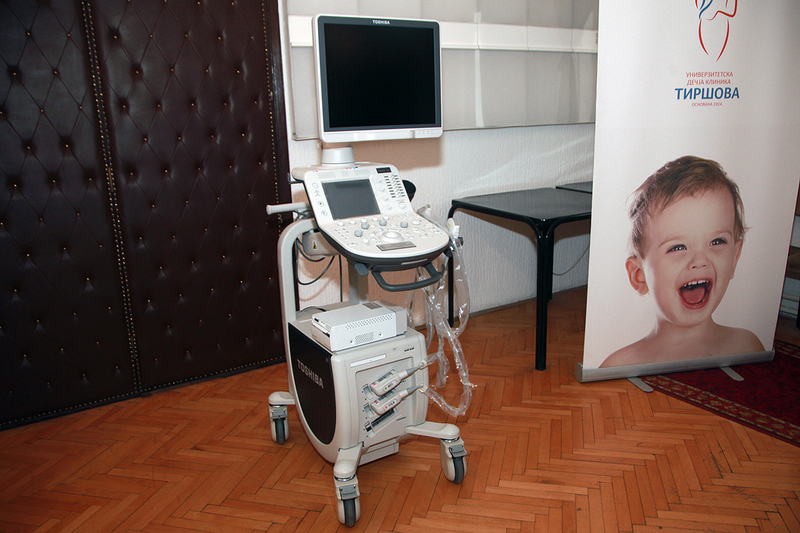 Her Royal Highness Crown Princess Katherine delivered a new ultrasound machine worth Euros 37,000 to the University Children’s Clinic in Tirsova. The appliance was donated by Ms. Rebecca MacDonald from Toronto Canada, in cooperation with the Crown Princess Katherine Foundation and the Lifeline Canada Humanitarian Organization, whose patron is Crown Princess Katherine. “The occasion for our today’s visit is the donation of an ultrasound machine for the children that is required in your work. This is the donation of Mrs. Rebecca MacDonald, a Serb who lives in Canada. The value of this donation is 37,000 euros. I am glad the diaspora has people of great heart, who wish to help our country and who did not forget their homeland. I will be glad to see more of such projects. My husband Crown Prince Alexander and I will continue to help as much as we can. I thank all the people of good will who support our activities and i invite them to join us in the future, too. I hope to return to your hospital and continue to help you, just as we have been doing for over 16 years. I wish you every success in your further work”, said Crown Princess Katherine. On behalf of the staff and patients, professor Zoran Radojicic, hospital director, thanked Crown Princess Katherine, her Foundation, and Ms. Rebecca MacDonald for their help. Ms. Rebecca MacDonald was born in Sarajevo and has been living and working for over 40 years in Toronto Canada, where she headed a gas and electricity company. Ms Rebecca MacDonald is a great benefactor and humanitarian, and for her contribution to the development of the Serbian community in Canada, she received the Order of St. Sava. The Foundation of Crown Princess Katherine has recently achieved one of the most successful periods since its establishment 25 years ago. In the past few months, the total value of donated new medical equipment reached $ 1,731,000. The largest part of these funds, $ 1.4 million, refers to valuable sterilization equipment for hospitals in Belgrade, Novi Sad and Kraljevo, which Crown Princess Katherine provided in cooperation with the Project C.U.R.E from Denver Colorado. In July this year, the Clinical Centre Nis received a new digital mammography with biopsy, worth $ 300,000, which was provided by the Crown Princess Katherine Foundation in cooperation with the Hologic Company from Marlborough Massachusetts. On that occasion, the Crown Princess delivered a $ 10,000 worth patient-monitor to the Centre for Children’s Surgery and Orthopaedics at the same Clinical Centre, donated by the Lifeline New York Humanitarian Organization. Early in August, Crown Princess Katherine delivered two $ 21,000 worth patient monitors to the Children’s Oncology Department at the Neurosurgery Clinic at the Clinical Centre of Serbia.